Con-Tact® has been the best selling consumer decorative coverings brand in North America since its invention in the 1950's. Sold in retail, drug, hardware and grocery stores, Con-Tact® “paper” is a printed, self-adhesive PVC film typically packaged in rolls sized 18” x 9’. Used to cover drawers and shelves in millions of homes, the market for these products is roughly $200 million in the US alone. However, despite being the market leader in this category, Con-Tact® product quality and design deteriorated over the company’s 50-year history. 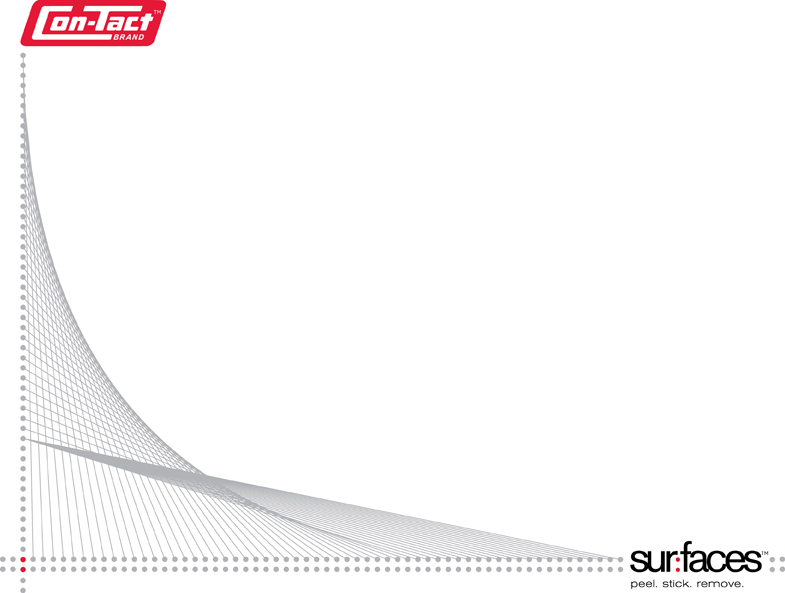 Kittrich Corporation, manufacturer of the second most popular brand, Magic Cover®, acquired Con-Tact® in 2004. The merger rationale was solid: Capitalize on economies of scale through combined distribution and consolidated manufacturing. In 2005, I proposed and was subsequently contracted by Kittrich to differentiate the two existing brands and launch an environmentally sustainable, design-driven product line under a new, premium brand. These high-margin products targeted new demographics, expanded the company’s distribution channels and reduced the client’s use of PVC, an energy-intensive and toxic material. How could Kittrich realize the intended economies of scale and expand profit margins without cannibalizing their secondary brand? The solution was a multi-brand strategy that forged tiers of perceived value through highly tailored brand messaging, product design, artwork, packaging and retail displays. The first step was to detail a brand roadmap to differentiate Con-Tact® from Magic Cover® and realign operations and marketing accordingly. Next, I streamlined the creative process and formed a 10-person branding and graphic design team under my management to handle the artwork production requirements. Lastly, we all worked together with existing management to enact the new strategic positioning. Before approaching the company, I had conducted substantial research and development to create a competing product. During this research phase, I discovered that Con-Tact® had not updated is product formulation, functionality, marketing program or aesthetic in nearly twenty years. Without quick, decisive action, the company would miss an opportunity to position its products as indispensable design tools during the rebirth of DIY and modern decorating in America. How might Kittrich leverage the existing Con-Tact® platform to market a new, design-driven brand? How might we expand distribution channels to include specialty and boutique retail? Were rolls of Con-Tact® "paper" really the best way to approach a new target demographic? Answering these questions required a fundamental understanding and re-imagining of the brand, its customers, products and core concepts. 1) The brand's true value was in the product concept (protective decoration), which had broad applications outside kitchen cabinets, but we needed to move beyond that stigma first. 2) Particularly popular among younger demographics, the personalization, embellishment and customization of goods was a longer-term trend, not just a fad. 3) We viewed environmental sustainability as an imperative, an inevitable. Younger demographics were especially sensitive to ecological concerns. Strategically, “green” solutions required R&D investment and, therefore, created barriers to entry. 4) Kittrich possessed the strongest brand platform, widest distribution network and largest economies of scale of any company operating in the consumer decorative coverings market. 5) Not all customers wanted gingham plaids and floral prints. Modern design could be a powerful competitive differentiator and would play an integral role in our strategy. Again, younger demographics were much more receptive to edgy artwork. Based on these findings, our target demographic was tweens to urban thirtysomethings; a large, diverse demographic with high levels of disposable income. The next challenge was to identify new applications of the product concept. 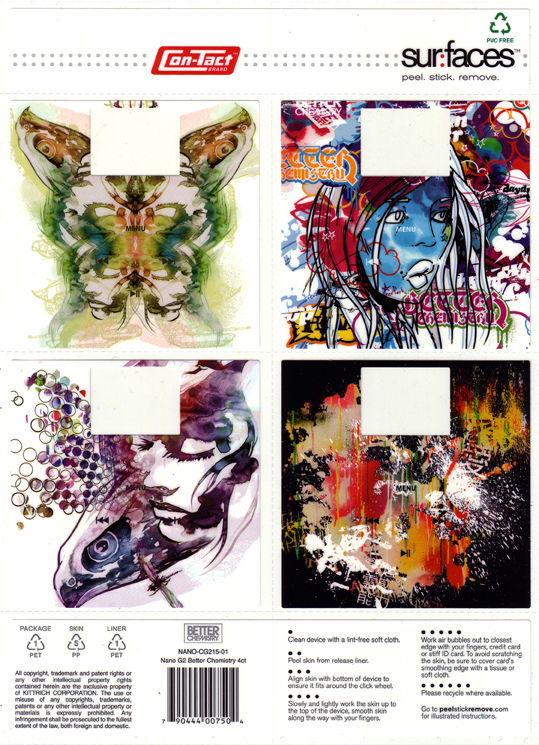 To connect with the target audience, we planned a line of self-adhesive removable “skins” for personal electronics like iPods. A tailor-made application of the new Con-Tact®, skins combined personalization (decoration) with real utility (protection). To be a stable platform for the future, they had to be “green”, perform better and cost less than competitive products. The final development phase involved re-engineering everything to withstand the demands of real world use. 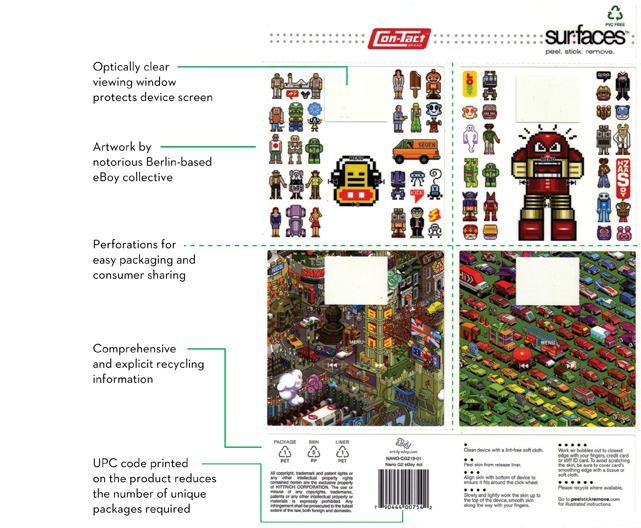 This meant researching and integrating recyclable, non-PVC materials, water-based adhesive systems, trendy artwork from global artists, recyclable packaging and a unique brand identity. Con-Tact® sur:faces™ launched at the 2007 Consumer Electronics Show in Las Vegas. These products were fabricated in the US from domestically sourced, superior quality non-PVC materials and next-generation printing processes using a recyclable, synthetic release liner. The minimal packaging system was designed to promote strong retail sales while reducing both the material load and the embodied energy in production and shipping. Despite the competitive superiority of the line, careful design and economies of scale allowed us to keep MSRP and unit costs well below market while generating profit margins four to five times the company average. Our team secured exclusive, multi-million dollar international distribution for the entire line in Summer 2007. The brand and core material technology is highly adaptable to new products and Kittrich will eventually replace many of its PVC products with those made from economical, high-quality, non-PVC materials. The most significant environmental benefit, however, came as a byproduct of bringing together the vendors who make the raw material for future Con-Tact® sur:faces™ products. Eventually, that partnership will eliminate thousands of tons of PVC from the environmental life cycle each year.